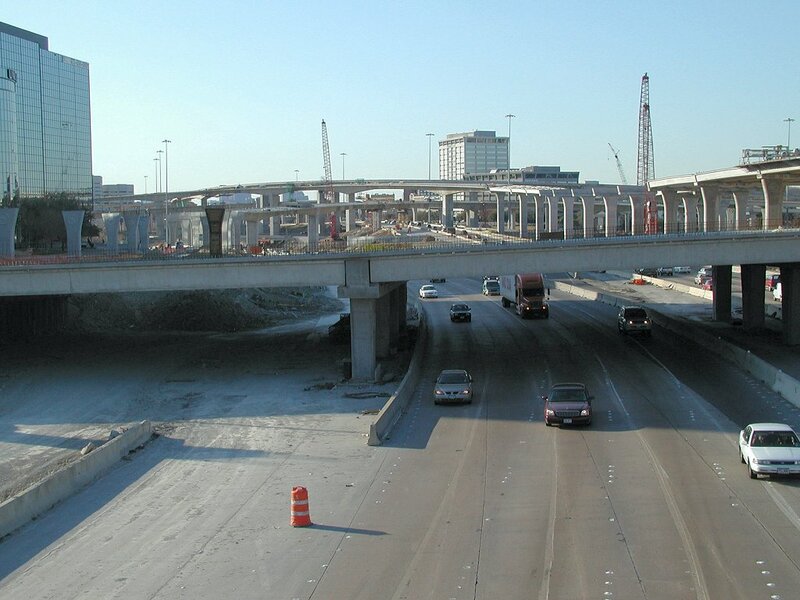 (Photo by Erik Slotboom) This view looks north along US 75 (Central Expressway) on December 12, 2003. 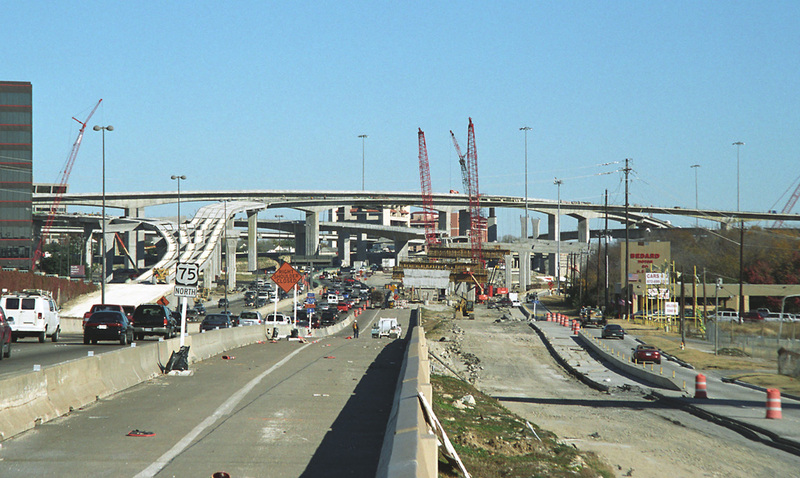 (Photo by Erik Slotboom) This view looks northwest on December 12, 2003, with the frontage road in the foreground and the eastbound IH-635 main lanes in the midground. This view looks east from the Coit overcrossing on the west side of the interchange. The paint scheme for the pillars is starting to take shape. I'll have to get used to the bright colors. I'm wondering if the bright green is the final color or if it is a test or primer. 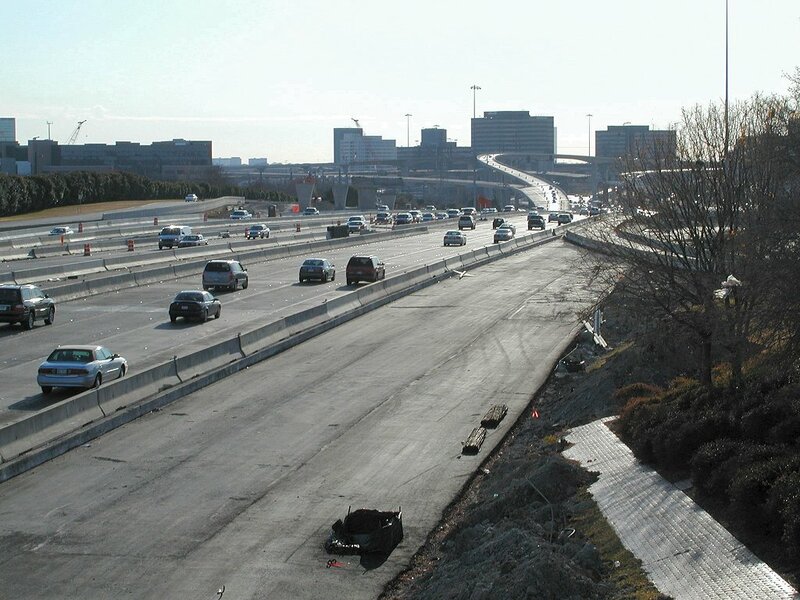 The high ramp crossing from the right side of the photo to the left is the first ramp in the project to open to traffic. 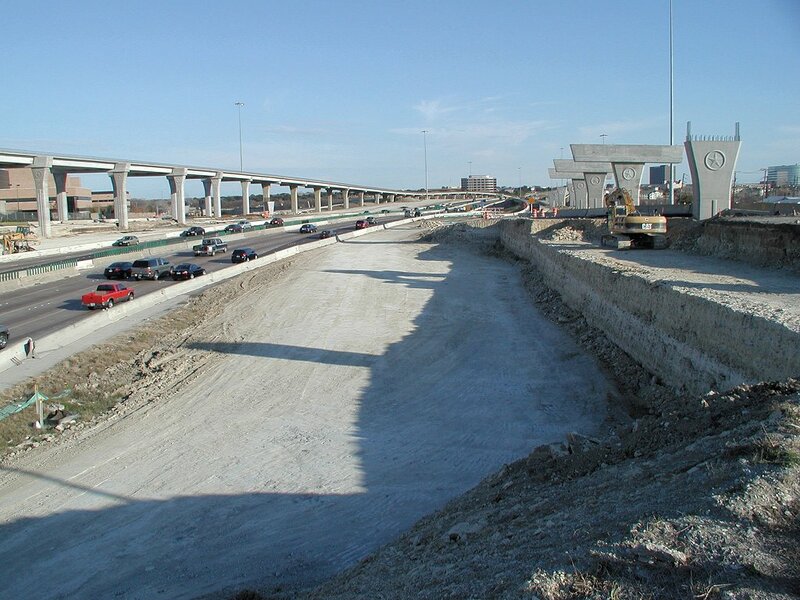 A wider view looking west along IH 635 from the Coit Road overpass. 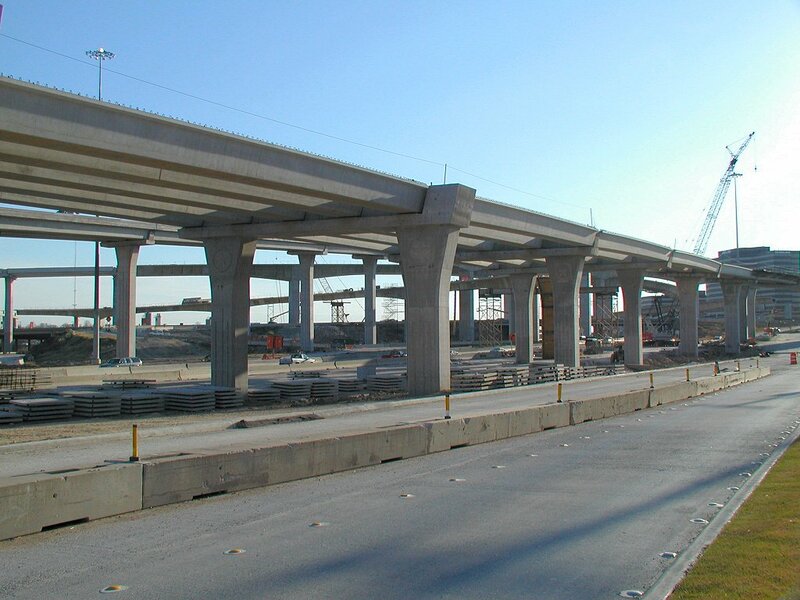 The new eastbound feeder (frontage) road under construction at IH 635. 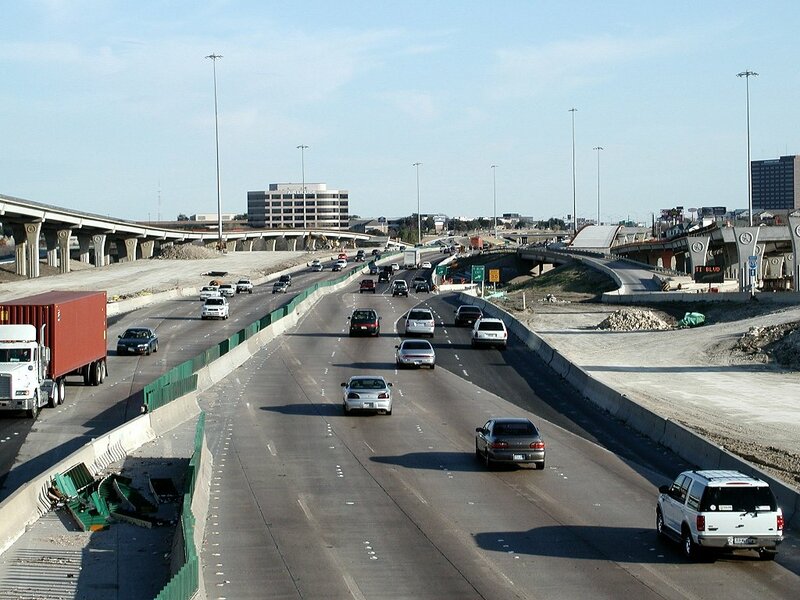 The feeder roads from both IH 635 and US 75 will cross through the interchange. 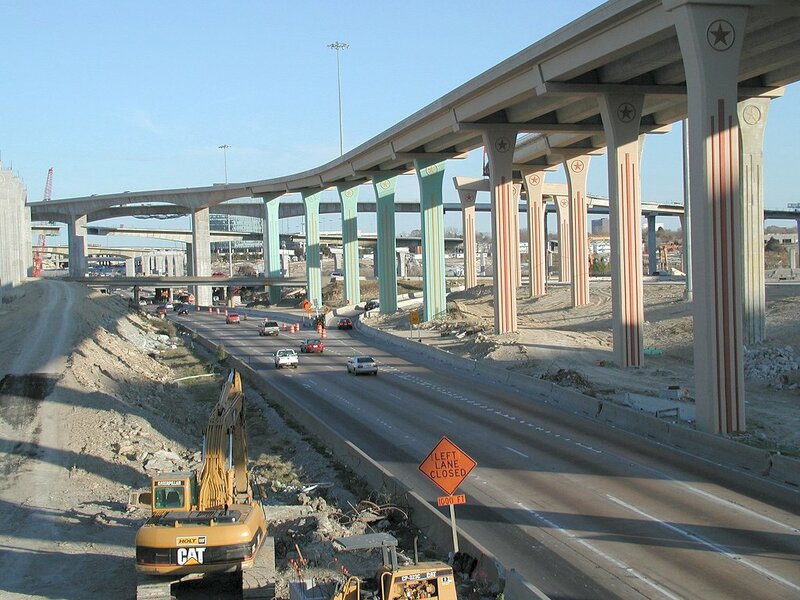 This will be the first major interchange in the Dallas-Fort Worth area to have both directions of feeder roads cross through the interchange. 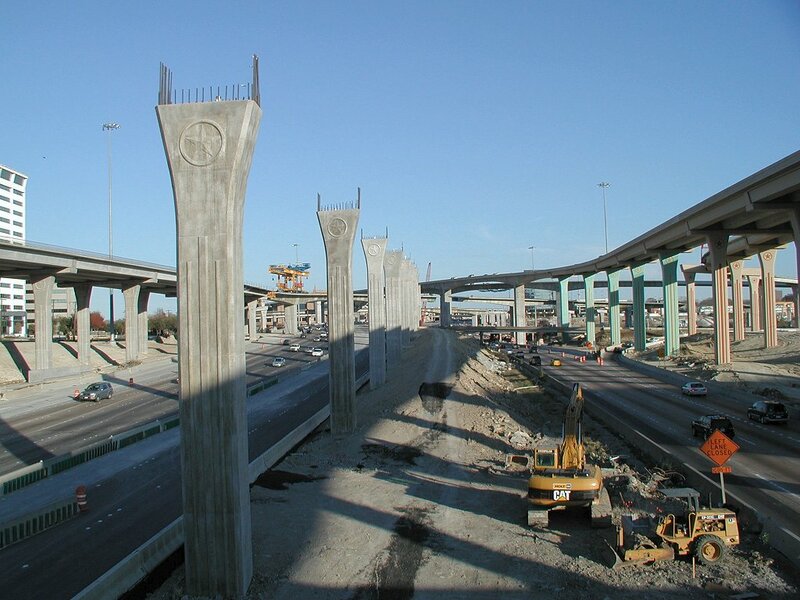 The cloverleaf at IH 635 and the Dallas North Tollway has frontage roads through (actually over) it, but that's not really the same thing since a cloverleaf is not a multilevel interchange. 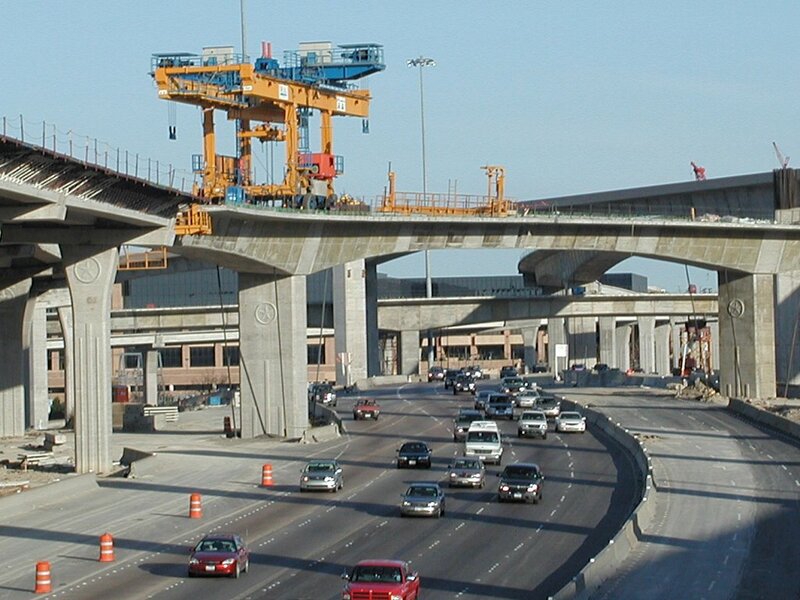 Houston has been bringing both directions of feeders through its interchanges since the 1980s. This view looks east along IH 635. Ramp construction is nearing completion and the segmental assembly machine will soon be retired from service. This view looks southeast at the connection ramps. 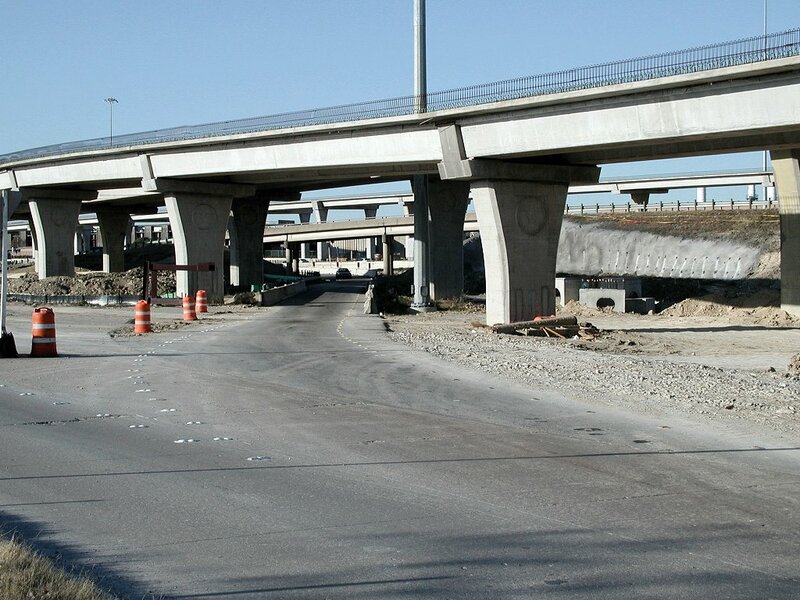 This view looks south along Central Expressway (US 75) on the north side of the interchange. Visible in the distance is the newly opened ramp. 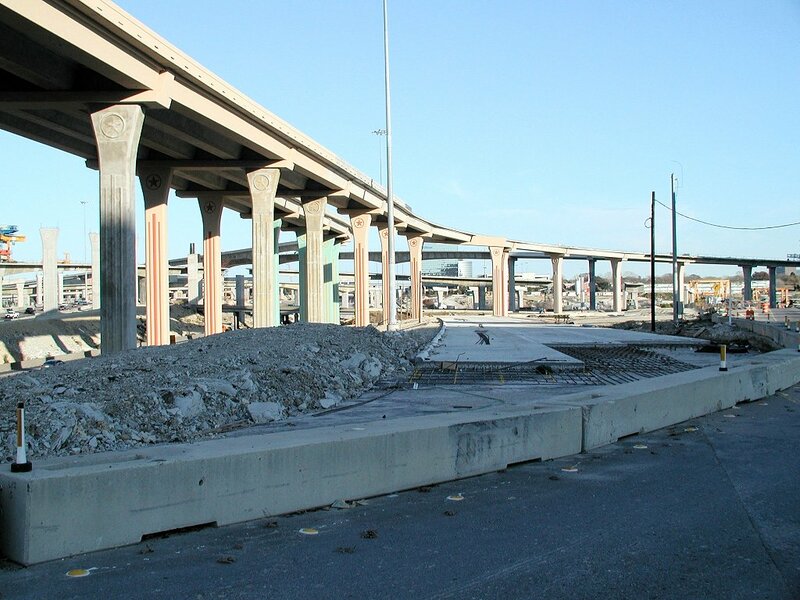 This is the ramp exiting from US 75 southbound, for connections to IH 635. This view looks west on the east side of the interchange. 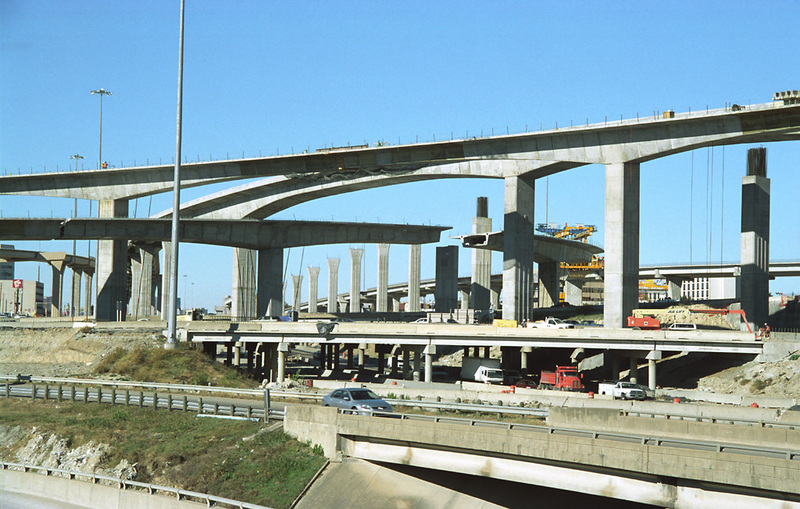 This view looks east on the east side of the interchange, from the same overcrossing as the above photo. 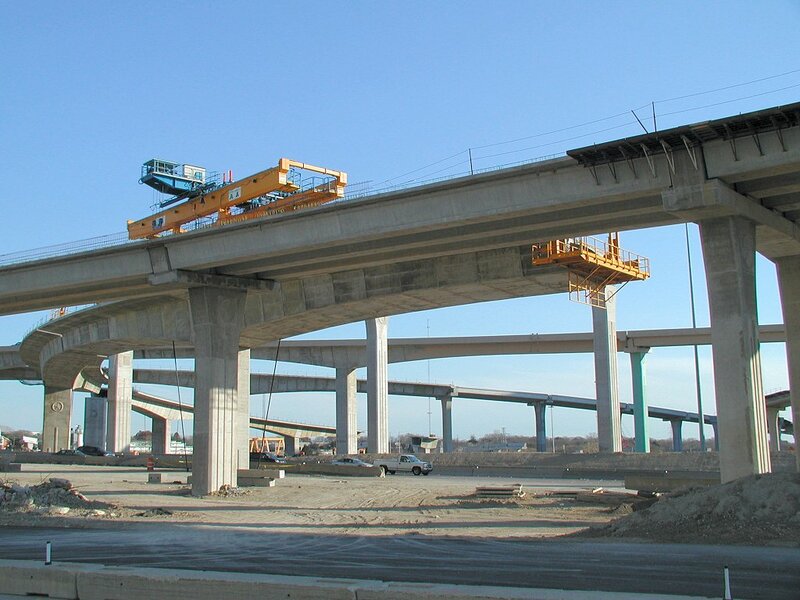 This view shows just how long some of the connection ramps are. 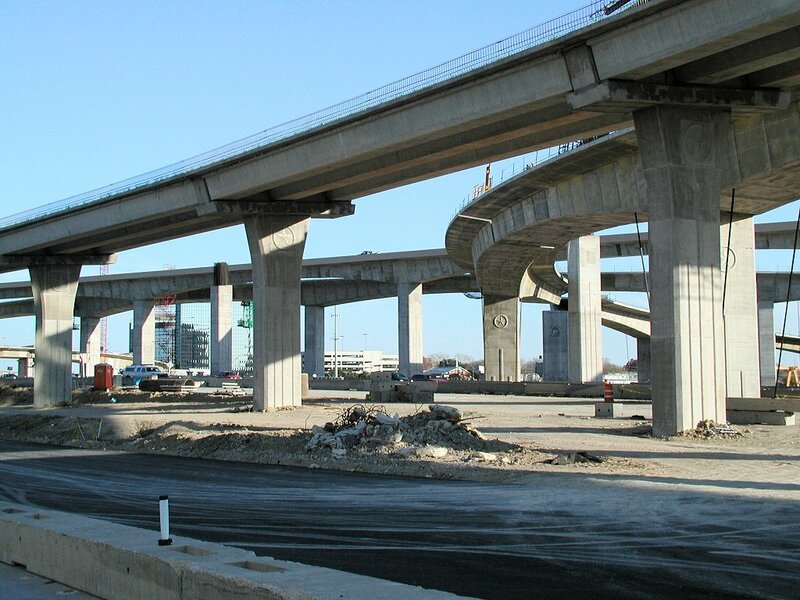 This view also looks east on the east side of the interchange. 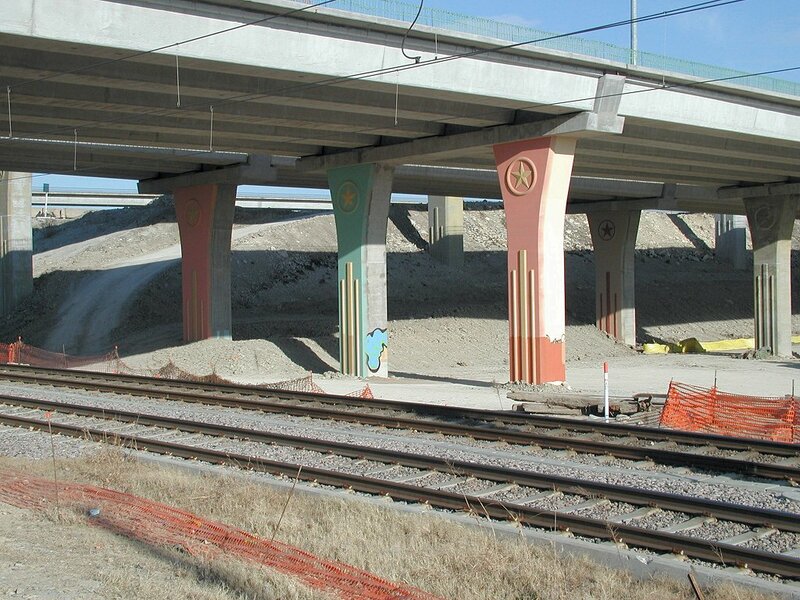 Column painting in progress at the Greenville/DART rail overpass. The extra color on the columns shown here is probably because of the nearby light rail station. TI (Texas Instruments) Boulevard exit on IH 635.